So after a month of using the Kerastase Transforms Shampoo and Conditioner I must admit that I AM A FAN! I was a skeptic. I really didn't think this line was going to be any different from a drug store line. This line is for over-processed and very damaged hair, their main claim is the dramatic difference from using the conditioner first rather than the traditional method of using shampoo. I already wash my hair conditioner first so I really wasn't expecting to be amazed, but the formula sold me. The conditioner is actually rather thin. I was worried. I am all about some thick and creamy conditioner. Trying it out I was surprised, It was very soft and moisturizing. I was able to distribute the conditioner throughout my hair easily. I clip my loaded hair up and go about my shower. When I'm nearly done with my shower I then wash out the conditioner, mainly my scalp, I like leaving the conditioner on my ends while I scrub in the shampoo. The texture of the shampoo is so bizarre. Its very thick and almost like a gel. I use maybe a nickle sized amount and only apply it to my scalp. Quick rinse out. The end. My hair is softer, shinier, more manageable. I can go longer in-between washing as compared to other shampoo/conditioners. Seriously I can go 4 days without washing my hair. That is with me working out everyday. I know, so gross. My hair is so long and thick, to wash and style everyday is ridiculous to consider. Honestly I really really REAAALLLY like this stuff. The smell is nice and fancy. The only "flaw" is the packaging. I hate having to unscrew the lids. It is just annoying and I'm always dropping them. The conditioner is a few ounces smaller than the shampoo which is crazy to me! I'm applying the conditioner from root to end, and the shampoo only to my scalp. Would I buy this? Yes! would I use it every wash? probably not due to the price point. I'd want to alternate between this and a drugstore version. Reverse Fiber Renewal Care Conditioner created to use before shampoo to protect & repair very damaged, over-processed hair without the weigh-down effect. Acts like a caring gauze to protect the fiber before shampoo. Extra Creamy Shampoo Fiber Renewal Care for very damaged, over-processed fine, medium and thick hair. The 1st shampsoo with a unique jellified texture that repairs the hair fiber while gently cleansing. Envelops the fiber during cleansing to reduce friction. 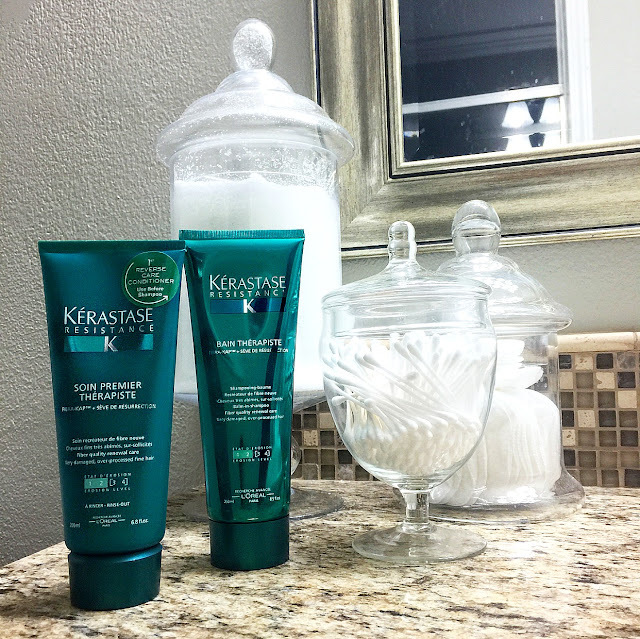 I received this product free in my Influester VoxBox #KerastaseTransforms.